The Ellicott City Old Town Market will be located at the parking lot and on grounds of HEC’s home office, the historic Mt. Ida mansion, until further notice this market season. The Ellicott City Old Town Market offers locally grown seasonal veggies, fruits, meats, cheeses, baked good, prepared foods and merchandise from several Main St. merchants. The Market is held every Saturday from 9 to 1 until market season is over, typically early Fall. Mt. 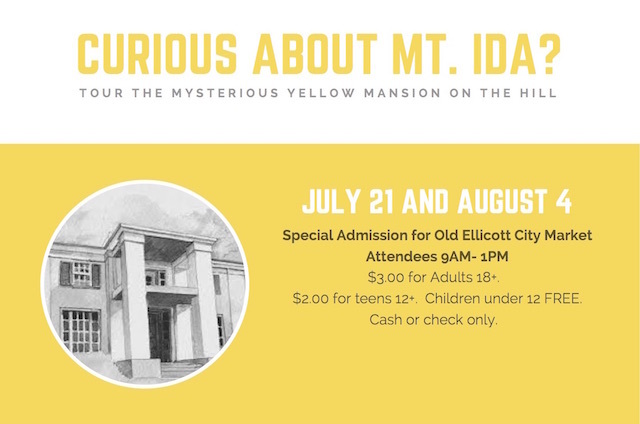 Ida is the yellow stucco house next to the Courthouse parking lot. Mt. Ida was built in 1828 for William Ellicott, the grandson of Andrew Ellicott, one of the founders of Ellicott City. The last home built by the Ellicotts in the historic district, this Greek Revival-style mansion was designed by Robert Carey Long, Jr. and constructed by Charles Timanus. William Ellicott died in 1836 and Judge John Shoemaker Tyson, his wife, their son John, and three daughters, Cornelia, Anna and Ida moved in. Their daughters never married and lived at the mansion all their lives. The last daughter, Mt. Ida’s namesake and supposedly its resident ghost, died here in 1925. 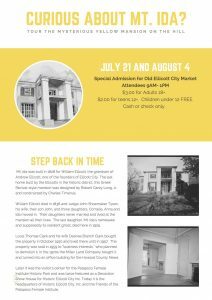 Louis Thomas Clark and his wife Desiree Branch Clark bought the property in October 1930 and lived there until in 1957. The property was sold in 1959 to “business interests,” who planned to demolish it. In the 1970s the Miller Land Company bought it and turned into an office building for the Howard County News. Later it was the visitor’s center for the Patapsco Female Institute Historic Park and was twice featured as an HEC Decorator Show House. Today it is the home office of both HEC and the Friends of the Patapsco Female Institute.